Need storage space in San Diego County? 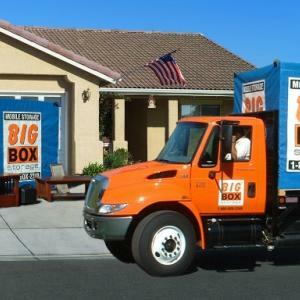 Have one or more "Big Box" storage units (each measure 8' x 5' x 7') delivered right to your address, load it at your own pace, and it'll be picked up for accessible, indoor storing in the nearby Big Box Storage facility. Mention promo code FIT and you'll receive a monthly rent rate of just $59 per Big Box (a 20% savings). Additionally, store for a minimum of 3 months and also receive FREE delivery and pickup (an additional $99 savings). All rates are backed by a low price guarantee. Each portable Big Box is 8' x 5' x 7' (L x W x H) - about enough for 1 and a half rooms. Multiple Big Boxes can be delivered if needed. Access your belongings seven days a week. Ultimate convenience - forget renting/loading/unloading a truck. Load the Big Box and you're done. Big Boxes are sturdy, mold and mildew-retardant and stored in a controlled-environment facility. Facilities offer 24/7 security and are monitored with advanced anti-theft alarms.